For Invasion Mid Ulster, held in aid of ‘Charis Cancer Care’ we held a competition to win a Hamper worth £199 packed full of Star Wars goodies. 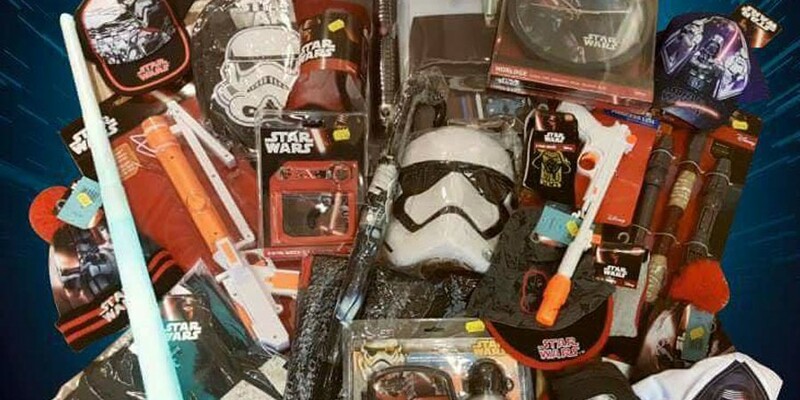 The hamper included; a Light Sabre, a Star Wars Clock, a Star Wars School Bag, a Star Wars Towel, a Star Wars Filled Pencil Case, a Sandwich Box, a Clone Trooper Blaster, a Star Wars Umbrella, a Star Wars Watch, a Star Wars Lunch Box & Bottle, a Stormtrooper Mask, a Rey Weapon and Kids Jedi Costume, a Kylo Ren and Sith Lord Hat, 2 pairs of Star Wars Socks, a Star Wars Blaster, two Star Wars Beanie Hats, a Vader & Stormtrooper Baseball Hat, two different designed Star Wars T-Shirts and most importantly, a superb Family Pass to the INVASION event itself. We hope so too Kelly and we look forward to seeing you in August at our unofficial fan event, Invasion Mid Ulster.